I feel like it was just yesterday when I typed up my last blog, but turns out its been a week! Time continues to fly, and the past week has been really exciting. Since I wrote last, we’ve had a big New Years Celebration with the Uncles and fellows. That day also marked the arrival of our newest Fellow Mallory OT. She is a pediatric Occupational Therapist, and has been a welcome addition to the crew. Additionally, we’ve added Doctor Frank to the mix, which has been really good for the school…Its amazing how many medical problems go overlooked on a regular basis. The clinic has been flooded since his arrival with some really bizarre ailments emerging. Beyond our new friends, we’ve been very busy at school. Kelly and I have been working with the boys and girls, and we officially have a Varsity Boys Soccer Team and a Varsity Girls Volleyball Team. We’ve had some really good practices already, and are working with some of the other schools in Surkhet to play a few games with some of the other local schools. Right now the top two teams are the Army School and SOS so we’ll see how it goes. I’m working with the boys, and Kelly has been working with the girls. The kids are super enthusiastic, and it’s been a wonderful addition to the school day. As the boys football coach I’ve been trying to instill the values that helped me succeed in wrestling, which are Discipline and Conditioning. We’ve been starting practice promptly at 4:30 and I’ve really been working hard to make sure everything is organized and running smoothly. I’ve called upon many years of sports to establish a practice plan which is both fun, and demanding. For the first week of practice we’ve been running sprints for the last ten minutes. As an added bonus for the kids, I’ve been running with them every day…Thankfully my conditioning is still decent, and I’m still able to outlast the players (otherwise I don’t think I’d be taking part in the sprints). In addition to sports, I’ve been teaching A LOT lately, which has been fun. I really enjoy most of the classes, and I’m feeling more and more comfortable with everybody’s name. One of my favorite girls in the entire school, Bipana shows up every morning and runs to give me a hug and give me a present. Whether it’s a piece of fruit or a little note, I’ve been getting a little treat from my second grade all-star pretty much every day. I will not lie, cheat, steal, or disrespect others. Membership in our student body requires a commitment to the Honor Code of Kopila Valley School. I’ve been going around to the classrooms for the past few days, explaining the importance of adhering to this code, and making them sign a slip consenting to our policy. While this is over the head of some of our youngest students, we’ve all agreed that is never too early to start learning these fundamental life lessons. On a more exciting note, Safira, Kelly, Ben and I are leaving for a weeklong vacation on Friday. We’ll be flying directly from Surkhet to Kathmandu (this service is brand new and we’ll be on the second flight ever). 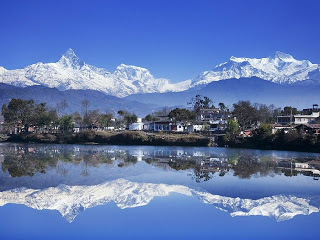 After spending a couple days in Kathmandu, we’re taking a bus to Pokhara which is viewed by many as the world’s most beautiful city. 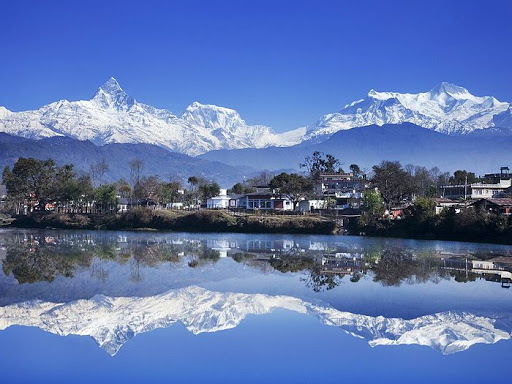 We’ll be staying on Lake Phewa which is not only one of Nepal’s largest lakes, but the lake also bumps directly into the Himalaya’s. During or trip we’ll be embarking on several treks, possibly some paragliding, and enjoying some much needed adult time after spending the past 4.5 months with children 24/7. I’ll be sure to take plenty of pictures from our trip, and post them in my next blog. For my final comment…I continue to love life so much over here that I’ve decided to extend my Asian adventure for another month. Originally I was planning to fly home on April 1, however, with nothing to do during April, and my furniture going into storage soon I’ve decided to stay until the end of April, which is my absolute drop dead date cut-off. One of my best friends is getting married in Houston on April 27th, which means I will be back in the states a few days before his big day. Hope all is well at home…Miss everyone lots. Merry Christmas & Annual Day!